"Please, Madam Mother, could you lend me my wife for half an hour? The luggage has come, and I've been making hay of Amy's Paris finery, trying to find some things I want," said Laurie, coming in the next day to find Mrs. Laurence sitting in her mother's lap, as if being made `the baby' again. "Certainly. Go, dear, I forgot that you have any home but this." And Mrs. March pressed the white hand that wore the wedding ring, as if asking pardon for her maternal covetousness. "I shouldn't have come over if I could have helped it, but I can't get on without my little woman any more than a..."
"Weathercock can without the wind," suggested Jo, as he paused for a simile. Jo had grown quite her own saucy self again since Teddy came home. "Exactly, for Amy keeps me pointing due west most of the time, with only an occasional whiffle round to the south, and I haven't had an easterly spell since I was married. Don't know anything about the north, but am altogether salubrious and balmy, hey, my lady?" "Lovely weather so far. I don't know how long it will last, but I'm not afraid of storms, for I'm learning how to sail my ship. Come home, dear, and I'll find your bootjack. I suppose that's what you are rummaging after among my things. 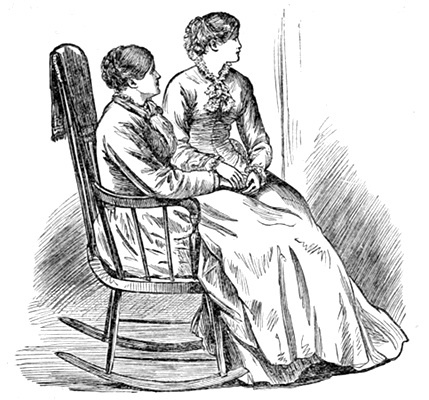 Men are so helpless, Mother," said Amy, with a matronly air, which delighted her husband. "What are you going to do with yourselves after you get settled?" asked Jo, buttoning Amy's cloak as she used to button her pinafores. "We have our plans. We don't mean to say much about them yet, because we are such very new brooms, but we don't intend to be idle. I'm going into business with a devotion that shall delight Grandfather, and prove to him that I'm not spoiled. I need something of the sort to keep me steady. I'm tired of dawdling, and mean to work like a man." "And Amy, what is she going to do?" asked Mrs. March, well pleased at Laurie's decision and the energy with which he spoke. "After doing the civil all round, and airing our best bonnet, we shall astonish you by the elegant hospitalities of our mansion, the brilliant society we shall draw about us, and the beneficial influence we shall exert over the world at large. That's about it, isn't it, Madame Recamier?" asked Laurie with a quizzical look at Amy. "Time will show. Come away, Impertinence, and don't shock my family by calling me names before their faces," answered Amy, resolving that there should be a home with a good wife in it before she set up a salon as a queen of society. "How happy those children seem together!" observed Mr. March, finding it difficult to become absorbed in his Aristotle after the young couple had gone. "Yes, and I think it will last," added Mrs. March, with the restful expression of a pilot who has brought a ship safely into port. "I know it will. Happy Amy!" And Jo sighed, then smiled brightly as Professor Bhaer opened the gate with an impatient push. Later in the evening, when his mind had been set at rest about the bootjack, Laurie said suddenly to his wife, "Mrs. Laurence." "That man intends to marry our Jo!" "I hope so, don't you, dear?" "Well, my love, I consider him a trump, in the fullest sense of that expressive word, but I do wish he was a little younger and a good deal richer." "Certainly not, though you do hear charming girls say that they intend to do it sometimes. If my memory serves me, you once thought it your duty to make a rich match. That accounts, perhaps, for your marrying a good-for-nothing like me." "Oh, my dearest boy, don't, don't say that! I forgot you were rich when I said `Yes'. I'd have married you if you hadn't a penny, and I sometimes wish you were poor that I might show how much I love you." And Amy, who was very dignified in public and very fond in private, gave convincing proofs of the truth of her words. "Am I an idiot and a brute? How could I think so, when you refused a richer man for me, and won't let me give you half I want to now, when I have the right? Girls do it every day, poor things, and are taught to think it is their only salvation, but you had better lessons, and though I trembled for you at one time, I was not disappointed, for the daughter was true to the mother's teaching. I told Mamma so yesterday, and she looked as glad and grateful as if I'd given her a check for a million, to be spent in charity. You are not listening to my moral remarks, Mrs. Laurence." And Laurie paused, for Amy's eyes had an absent look, though fixed upon his face. "Yes, I am, and admiring the mple in your chin at the same time. I don't wish to make you vain, but I must confess that I'm prouder of my handsome husband than of all his money. Don't laugh, but your nose is such a comfort to me." And Amy softly caressed the well-cut feature with artistic satisfaction. Laurie had received many compliments in his life, but never one that suited him better, as he plainly showed though he did laugh at his wife's peculiar taste, while she said slowly, "May I ask you a question, dear?" "Shall you care if Jo does marry Mr. Bhaer?" "Oh, that's the trouble is it? I thought there was something in the dimple that didn't quite suit you. Not being a dog in the manger, but the happiest fellow alive, I assure you I can dance at Jo's wedding with a heart as light as my heels. Do you doubt it, my darling?" "I wish we could do something for that capital old Professor. Couldn't we invent a rich relation, who shall obligingly die out there in Germany, and leave him a tidy little fortune?" said Laurie, when they began to pace up and down the long drawing room, arm in arm, as they were fond of doing, in memory of the chateau garden. "Jo would find us out, and spoil it all. She is very proud of him, just as he is, and said yesterday that she thought poverty was a beautiful thing." "Bless her dear heart! She won't think so when she has a literary husband, and a dozen little professors and professorins to support. We won't interfere now, but watch our chance, and do them a good turn in spite of themselves. I owe Jo for a part of my education, and she believes in people's paying their honest debts, so I'll get round her in that way." "How delightful it is to be able to help others, isn't it? That was always one of my dreams, to have the power of giving freely, and thanks to you, the dream has come true." "Ah, we'll do quantities of good, won't we? There's one sort of poverty that I particularly like to help. Out-and-out beggars get taken care of, but poor gentle folks fare badly, because they won't ask, and people don't dare to offer charity. Yet there are a thousand ways of helping them, if one only knows how to do it so delicately that it does not offend. I must say, I like to serve a decayed gentleman better than a blarnerying beggar. I suppose it's wrong, but I do, though it is harder." "Because it takes a gentleman to do it," added the other member of the domestic admiration society. "Thank you, I'm afraid I don't deserve that pretty compliment. But I was going to say that while I was dawdling about abroad, I saw a good many talented young fellows making all sorts of sacrifices, and enduring real hardships, that they might realize their dreams. Splendid fellows, some of them, working like heros, poor and friendless, but so full of courage, patience, and ambition that I was ashamed of myself, and longed to give them a right good lift. Those are people whom it's a satisfaction to help, for if they've got genius, it's an honor to be allowed to serve them, and not let it be lost or delayed for want of fuel to keep the pot boiling. If they haven't, it's a pleasure to comfort the poor souls, and keep them from despair when they find it out." "Yes, indeed, and there's another class who can't ask, and who suffer in silence. I know something of it, for I belonged to it before you made a princess of me, as the king does the beggarmaid in the old story. Ambitious girls have a hard time, Laurie, and often have to see youth, health, and precious opportunities go by, just for want of a little help at the right minute. People have been very kind to me, and whenever I see girls struggling along, as we used to do, I want to put out my hand and help them, as I was helped." "And so you shall, like an angel as you are!" cried Laurie, resolving, with a glow of philanthropic zeal, to found and endow an institution for the express benefit of young women with artistic tendencies. "Rich people have no right to sit down and enjoy themselves, or let their money accumulate for others to waste. It's not half so sensible to leave legacies when one dies as it is to use the money wisely while alive, and enjoy making one's fellow creatures happy with it. We'll have a good time ourselves, and add an extra relish to our own pleasure by giving other people a generous taste. Will you be a little Dorcal, going about emptying a big basket of comforts, and filling it up with good deeds?" "With all my heart, if you will be a brave St. Martin, stopping as you ride gallantly through the world to share your cloak with the beggar." "It's a bargain, and we shall get the best of it!"